Dry mix for Gift Giving. Yield: (20) two-tablespoon servings of spice mix. Dry the orange: Preheat oven to 200 degrees F. Line a baking sheet with parchment paper. Slice the orange into 1/8-inch-thick rounds and place on the prepared baking sheet. Bake, turning occasionally, until dry 4-6 hours or use a dehydrator. 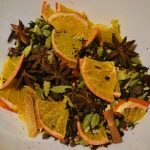 Make spice mix: Combine the dried orange and the rest of the ingredients except for the loose tea and toss to combine. Store the spice blend and the tea in separate airtight containers for up to 6 months. For Gift; package spice mix in glass containers with a tight fitting lid, attach a small scoop, tea strainer and a package of loose black tea. Instructions to serve: Simmer 2 tablespoons of the Chai spices with milk, water, and honey for 25 minutes. Add tea and steep for 3 minutes. Strain into 2 large mugs and serve immediately.